Calling the management of the Mediterranean bluefin tuna fishery “an international disgrace”, a high level review has called for an immediate suspension of fishing. Rome, Italy – Calling the management of the Mediterranean bluefin tuna fishery “an international disgrace”, a high level review has called for an immediate suspension of fishing. The still confidential review, commissioned last November by the International Commission for the Conservation of Atlantic Tunas (ICCAT), says the suspension should remain in force until the fishing nations that make up the members of ICCAT show that they “can control and report on their catch”. Failing that, the ICCAT Performance Review recommends that ICCAT's own secretariat take over the responsibility for catch auditing and inspection. The fishing ban should cover tuna caught for fattening in farms and ICCAT should consider “an immediate closure of all known spawning grounds at least during known spawning periods”, the review said. The review was chaired by Glenn Hurry, Chief Executive Officer of the Australian Fisheries Management Authority and current Chair of the Western and Central Pacific Fisheries Commission. Moritaka Hayashi, Professor Emeritus of International Law at Japan’s Waseda University, and Canadian international fisheries scientist Jean-Jacques Maguire, were the other members of the “independent” review established to follow “transparent procedures” in reviewing ICCAT. 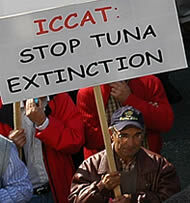 Mr Hurry and his fellow commissioners noted that “the judgement of the international community will be based largely on how ICCAT manages fisheries on bluefin tuna” and concluded that “the international community which has entrusted the management of this iconic species to ICCAT deserves better performance from ICCAT than it has received to date”. "collapse could be a real possibility"
“Such staggering conclusions from independent experts only reinforce what WWF has been saying for years – this is a fishery grossly out of control,” said Dr Sergi Tudela, Head of Fisheries at WWF Mediterranean. The report cites the “the under-reporting, mis-reporting and non-reporting” by Contracting Parties of Mediterranean catches, large takes of juvenile fish and large spawning tuna, the fishing in former refuges and the continued expansion of the industrial fishing fleet. “ICCAT Contracting Parties’ performance in managing fisheries on bluefin tuna, particularly in the eastern Atlantic and Mediterranean Sea, is widely regarded as an international disgrace,” states the review. The review panel justified its draconian recommendations saying that “with the fishing activity largely unregulated, the stock possibly at the point of collapse and (Contracting Parties) either unable or unwilling to force their industries to comply, few options for recommendations were available”. ICCAT Chair Fabio Hazin has urged parties to “be prepared” to discuss the report at ICCAT's forthcoming meeting in Marrakech in November. A man protests against the overfishing of Atlantic bluefin tuna in the Mediterranean.